Hmmm? What an interesting name to christen a film with. Surely it can't have anything to do with the exorbitant energy prices charged whilst make it? But then again, maybe it could have something to do with its Director: Roy William Neill; or one of his Actors: Basil Rathbone, Nigel Bruce, with Alan Mowbray. Let's find out, shall we? By watching this 60-minute masterpiece devised in 1946. There-there, Lady Carstairs (Mary Forbes). Please don't cry. I know your son has died under mysterious circumstances, whilst some dubious character has stolen your very valuable diamond. But please don't worry yourself so. Doctor Watson and Inspector Lestrade (Nigel Bruce and Dennis Hoey) are here by your side, upon this moving train heading towards Scotland. And of course, I'll be accompanying them too. I, the consulting detective -- Sherlock Holmes (Basil Rathbone) -- who your deceased sibling previously hired to look after you're very valuable keep-sake. Admittedly, it won't be easy on any of us to figure out who committed this grisly deed. Although I suspect that after the good Doctor pesters a handful of passengers, we'll be able to narrow down who the culprit actually is. For a start there's that Professor called Kilbane (Frederick Worlock), who is a rather rude fellow if I do say so myself. Then there's that somewhat forlorn female, Vivian Vedder (Renee Godfrey), who seems to be keeping her own council for the time being. Plus in addition to this, there Watson's old army pal, Major Duncan Bleek (Alan Mowbray), who... who... who... eeekk! Quick! Someone help me! Somebody has just tried to push me off of the train! Still. That's most probably why what next transpires all kicks off when a consulting detective grabs an investigation by its coffin-lid. As a diamond is ready to crack - please look forward whilst looking back - an inspector takes a bloody good whack - and when a train eventually reaches Scotland, a mastermind is kept totally in the black. The only problem I had with 'Terror by Night', were a couple of plot discrepancies I felt hindered the overall narrative. I mean, why would Sherlock name a suspect and then allow this person to overhear he's instigated a trap to catch him? Furthermore, why would he also allow this said-same-suspect to roam around the train Scott Free, when Holmes knows deep down inside himself that he will strike once again? Now do you see what I'm driving at, folks? Cause doesn't that sound rather 'out of character' for the Worlds Greatest Detective? Especially when you factor in that he had a plan to counteract his plan to begin with! Please, don't take what I've just said the wrong way. Despite not being too fond of this filmic-fault, that doesn't necessarily imply I didn't enjoy watching this film too. No. Of course not. Apart from this slight-slip in the general story-line, all in all I really did get a kick out of following this timely yet bumbling escapade. Yes. That is correct. I did say 'bumbling'. And one of the reasons why I've coined this 'farcical adjective', is because this adventure -- well, most of it, anyway -- had a rather bumbling feel to it -- particularly those scenes featuring Doctor Watson, plus that whole scenario nearing its conclusion. You see, from my point of view, this jovial tone helped the plot jump about from one scenario to another, whilst giving this murder mystery an almost debonair and formal tone. 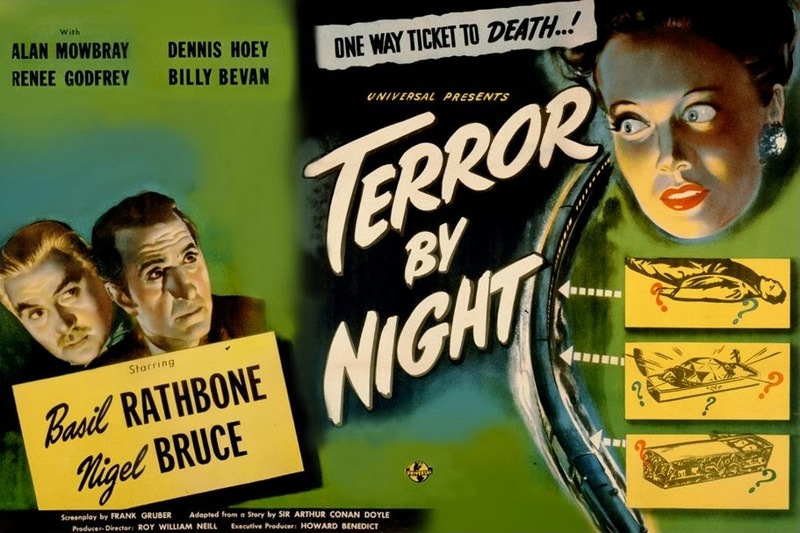 Also, I've got to applaud how Rathbone, Bruce, and Hoey, all managed to carry the weight of this film on their shoulders, mainly because the rest of the cast were... well... to put it likely, as stiff as a board, and as lifeless as one can be. Still. It was fairly easy for me to overlook this acting flaw, unlike you with these filmic-facts. (1) 'Universal Studios' first released this production on the very same day that the Norwegian socialist, Trygve Lie, became the first Secretary General of the United Nations -- the 1st of February, 1946. (2) Loosely translated, this project was entitled 'Jewellery Robbery' in Germany; 'The Death Train' in France; and 'Darkest Night' in Portugal. 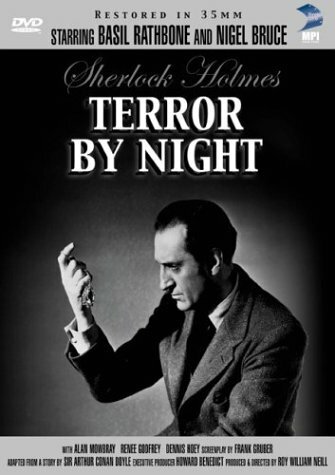 (3) Just like many of the other Holmes movies made at 'Universal', this majority of this one was also shot at 'Universal Studios', Universal City, situated in the American state of California. (4) Even though the central plot of this film wasn't directly based on any of Sir Arthur Conan Doyle's original Holmes stories, it does manage to use minor plot elements taken from 'The Adventure of the Empty House', 'The Disappearance of Lady Frances Carfax', and 'The Sign of the Four'. (5) Frank Gruber, who was the scriptwriter that adapted this piece into filmic-form, was given the title, 'king of pulp fiction', because in the 1930's, he got his big break by writing 'quickie' detective stories. (6) The title of this flick was taken from a biblical quotation -- Psalms, 91:5: 'Thou shalt not be afraid for the terror by night'. (7) Unlike many of the other Holmes movies made during this period, for some unexplained reason 'Universal' didn't renew the licence for this one, thus allowing it to slip into PD. 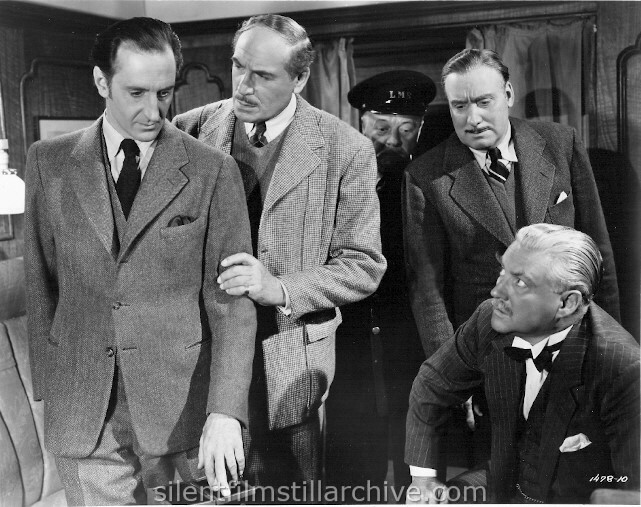 (8) After this picture jumped the lights, Basil Rathbone starred in the romantic-drama, 'Heartbeat'; Nigel Bruce starred in the next Sherlock Holmes film, 'Dressed to Kill'; and Alan Mowbray starred in the rom-com, 'Idea Girl'. Overall I'd say 'Terror by Night' was more like 'Bumble by Day'. The story was fairly fine, minus some loop-wholes. The acting was up to par, except for the dead wood. And by in large -- yeah -- this was one hell of a mystery to figure out, and I can't wait to watch the next one very soon.